TOKYO, June 10, 2014 - Canon Inc. today commemorated the 25th anniversary of the EOS-1 series, the flagship-model lineup of the Company’s EOS series of interchangeable-lens cameras, which debuted in 1989. In 1987, Canon launched EOS, the world’s first AF (autofocus) single-lens reflex camera to employ a fully electronic mount system, using electrical signals to control such functions as autofocusing and aperture adjustment. Two years later, in 1989, the Company introduced the top-of-the-line professional-model EOS-1. Created to satisfy the advanced demands of professional photographers, the camera marked the inaugural model of Canon’s EOS-1 series. Based on the EOS concept of delivering automated performance in accordance with the will of the user, the EOS-1 featured cutting-edge technologies, class-leading levels of performance, high durability, robustness and reliability. In 1994, as a growing number of professional photographers were making use of the autofocusing capabilities offered by cameras, Canon launched the EOS-1N, featuring an increased number of focusing points and increased predictive focusing when tracking moving subjects. 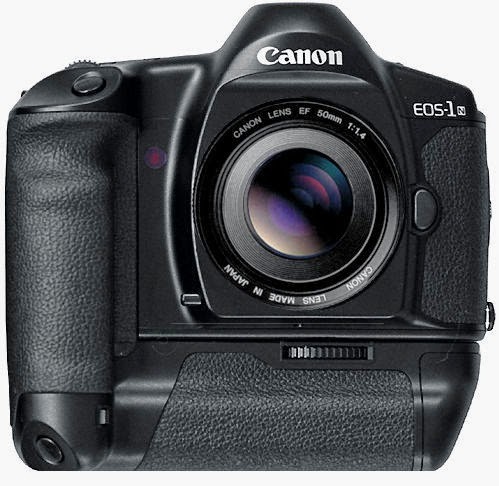 Additionally, in 2000, the Company introduced the EOS-1V, equipped with 45-point high-density Area AF, which contributed to high-speed predictive AF of up to 9 frames per second. In this way, Canon has consistently launched flagship-model SLR cameras designed to satisfy the demands of professionals in step with the changing times. Upon entering the digital era, Canon launched its first flagship-model professional digital SLR camera—the EOS-1D—in 2001, followed in 2002 by the EOS-1Ds, equipped with a full-frame 35mm sensor. Since then, the Company has reinforced its product lineup through efforts targeting enhanced image quality and continuous shooting performance. In June 2012, Canon released the EOS-1D X, its latest flagship pro-model digital SLR camera, marking the EOS-1 series’ 13th model since the launch of the original EOS-1. The 1D X has garnered strong acclaim from professionals working in a wide range of fields, from photojournalism and sports coverage to commercial and nature photography. Through the introduction of its powerful flagship-model EOS-1 series, incorporating cutting-edge technologies, and the expansion of these technologies and the functions they make possible, even to entry-level models, Canon continues aiming to enhance the value of its product lineup. In addition to its robust camera lineup, Canon contributes to developing the culture of photographic and video imaging though its efforts to fulfill the diverse needs of users.